Select either a package below OR Customize your trailer from the available option list below. Press continue to receive a quote on your DD-12-12'. Click the ‘?’ icon corresponding to each available option for a detailed description. Select from available packages below for great savings and combine with your own custom options to get the trailer you want! More info coming soon! If you require assistance, please call us at 1(800)306-2111. If you don’t want to see your trailer pass you on the road this is what you need. 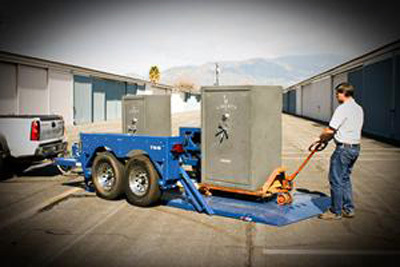 A Breakaway System is designed to bring a trailer safely to a stop by activating its electric brakes, should it be disconnected while towing. Slowing the trailer down to a stop. Many people would agree that trailer wiring is the single biggest complaint on a trailer. Our Duraflex Sta-Dry Sealed Wiring Harness is a modular harness system with the toughest integrated moisture/corrosion protection ever engineered. With no more blue clips or solder connections you won’t have to trace any more electrical issues. It features extremely tough harness components that are totally sealed against moisture and corrosion. With a Duraflex Sta-Dry Sealed Wiring Harness system, we now offer a three year warranty to all our trailers against defects and corrosion. The only way to improve this system would be to add long life maintenance free LED lights. A complete tie-down kit which includes recessed tie-down, backing plate for additional support, and bolts for installation. Keep bearings protected the easy way. Use the E-Z Lube option. The E-Z Lube design allows grease to flow with ease to both outer and inner bearings for a complete repack. It's E-Z because all you need to do is attach a grease gun at the end and insert the grease. No disassembly required! E-Z Lube's end cap allows for easy access, extra protection and no mess. With such complete lubrication, your running gear is protected from corrosion and water entry. E-Z Lube protection and maintenance features make it ideal for most any towable axle, whether it's for work or play. Give your running gear the protection and maintenance with E-Z Lube Hubs. We recommend an Interstate Deep Cycle Reserve Capacity Battery for all our Dump Trailers. It is the only way to go; a standard car battery will not do the job. An Interstate Deep Cycle battery is designed to provide a steady amount of current over a long period of time. It is designed to be deeply discharged and charged over and over again. Giving you many years of trouble free dumping. Reserve capacity is the number of minutes a battery can maintain a useful voltage under a 25 ampere discharge. The higher the minute rating, the greater the battery's ability to run your hydraulic pump for a longer period before recharging is necessary. Miska only uses Interstate Batteries, it's a high-quality product, which comes with a nationwide warranty and overall value make it a top selling Marine/RV battery. LED lights are solid-state devices that do not use a brittle metal filament that is susceptible to shock and vibration that incandescent lamps use. There are no moving parts to break. Their sealed design provides increased durability and reliability. When using LED lights, you will no longer have to worry about bad connections between the bulb and socket as a result of moisture, dirt and corrosion which is common to incandescent lamps. Because LED lamps are very energy efficient, they consume much less power than incandescent lamps and reduce electrical system load of the tow vehicle, extending battery life and possibly reducing fuel consumption. LEDs provide brighter illumination. They also illuminate instantaneous compared to incandescent bulbs. When used as tail/brake lights on your vehicle, your brakes lights are on instantly and at full brightness. This improves safety and makes your trailer more visible to other vehicles during stops and when turning. Most incandescent lights are rated for approximately 3,000 hours. LEDs typically last 50,000 hours or more. A perfect complement to our sealed wiring, which will give you a complete trouble free electrical system! 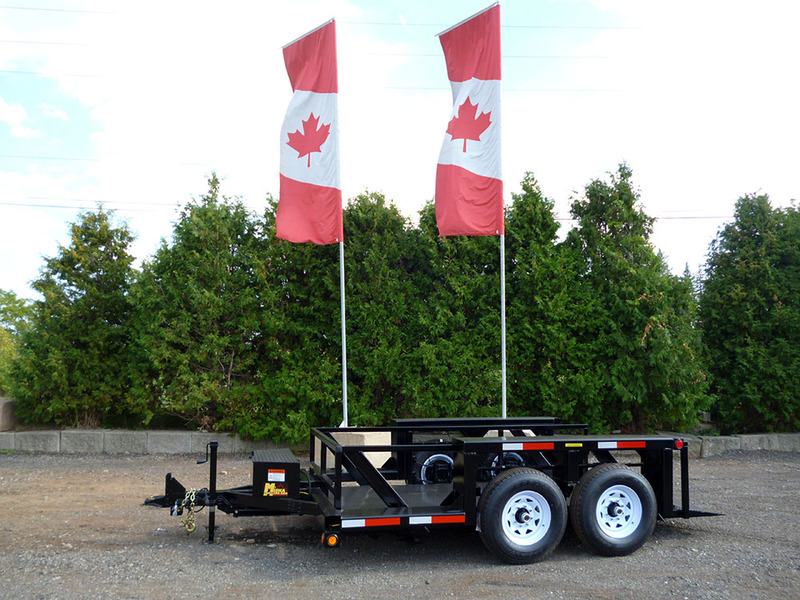 Customize your trailer further by selecting from available options below. Easy snap-in design; one-hand operation. Long-lasting stainless steel springs. Holds three trimmers. Vinyl coated hooks. LT10 secures with padlock (not incl.) Mounting hardware included. Black powder coat finish. Holds almost any Back pack Blower. Mounting hardware included. Black powder coat finish. Holds most standard coolers. Adjustable straps and mounting hardware included. Black powder coat finish. Holds one 5-Gallon or two 2.5-Gallon rect. polymer cans. Includes mounting hardware and strap to secure can(s). Black powder coat finish. Secures any 3- or 5-lb. trimmer line spool. Built to allow any style Pallet Forks to be easily accessable and stored safely under your trailer. 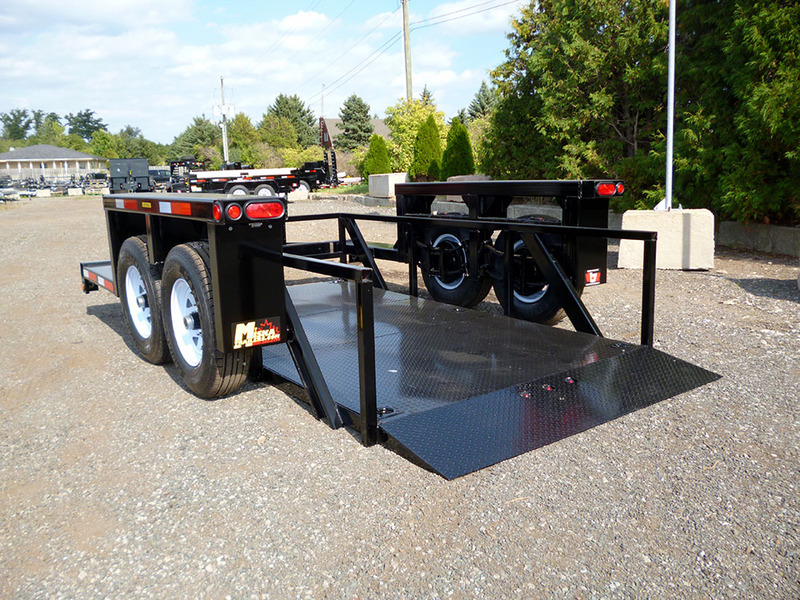 A 4 Bolt Pintle allow adjustment of the hitch height of the trailer, which allows the trailer to be towed by different vehicles. The Adjustable Channel Coupler permit adjustment of the hitch height of the trailer, which allows the trailer to be towed by different vehicles. Upgrade from the standard white spoke wheels to Galvanized Wheels. A must have for any trailer, don’t let a flat ruin your day. A spare tire can prove to be a life saver ... imagine in a time of emergency your trailer has a blowout, goes flat or gets punctured at that time your spare tire would save you!!! 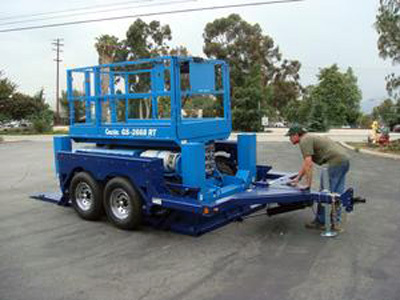 You will need it to get the toy’s home from up north or the tools/equipment to the job site. Also don’t forget the HD Checkerplate toolbox to keep your jack and tire wrench with the trailer. No your trucks jack and wrench won’t work. As defined, A sticker is required on a single truck, if its actual weight, registered gross weight or gross vehicle weight rating exceeds 4,500 kilograms (9,920 lb. ), or on both the truck and the towed trailer, if the combination's weight exceeds 4,500 kilograms. 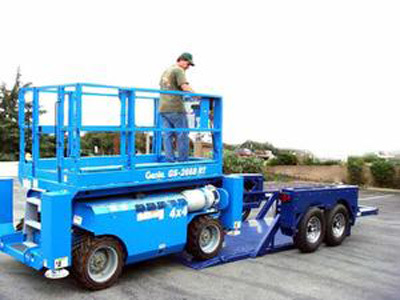 We have licensed mechanics on site to perform the Annual safety inspection and get you on your way. When the time comes to renew your safety please come back to see us. We have all the parts in stock for every trailer for quick and easy repairs to get you back on the road. We can arrange delivery for you. We will require a full address to be able to calculate the distance. If you’re as busy as most people are it can save a lot of time on a round trip. In this day and age time is money. Miska saves you both. 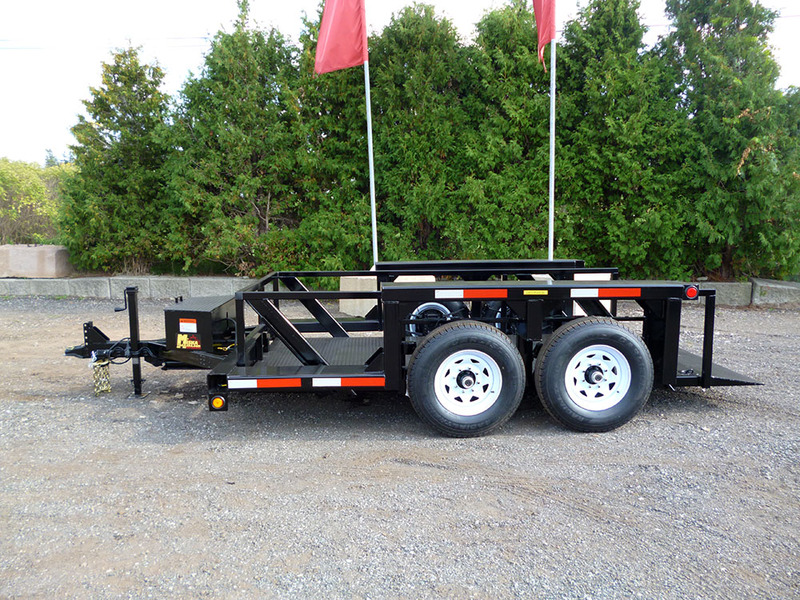 Want to Lease this Trailer? No problem. 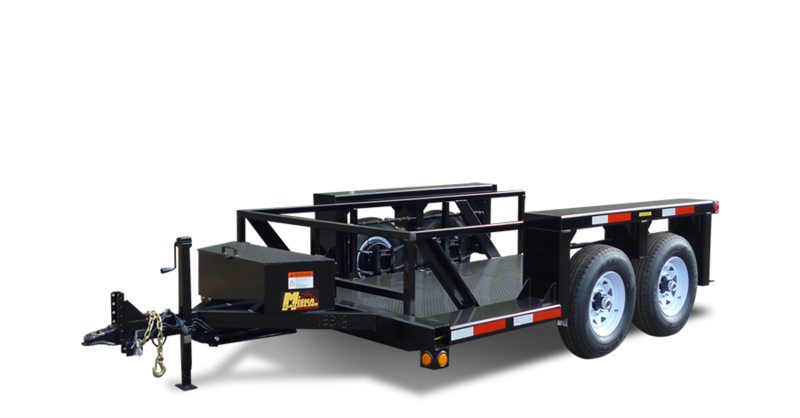 Miska's IN HOUSE FINANCING CENTRE is the easiest way to apply for the financing you want for the trailer you need. At Miska Trailers you simply fill out the application and we do the rest saving you time and money. Let us take care of that for you. All we will require is the business name or personal name that the trailer is to be registered under, and either a drivers license number or RIN number. Our customers that have chosen to get their own plates have been gone for up to an hour and a half waiting to get their plate. It is much easier just to hook up and go with everything done for you. An Electric Jack makes life easy. 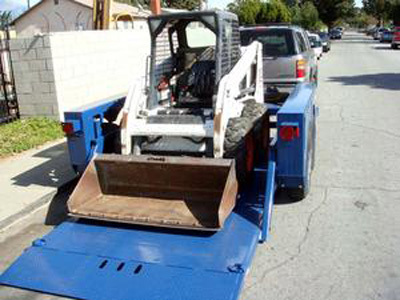 Simply push the button to quickly and effortlessly raise or lower the trailer without breaking a sweat. Upgrading the Jack will give you the confidence you may need for those heavier loads. 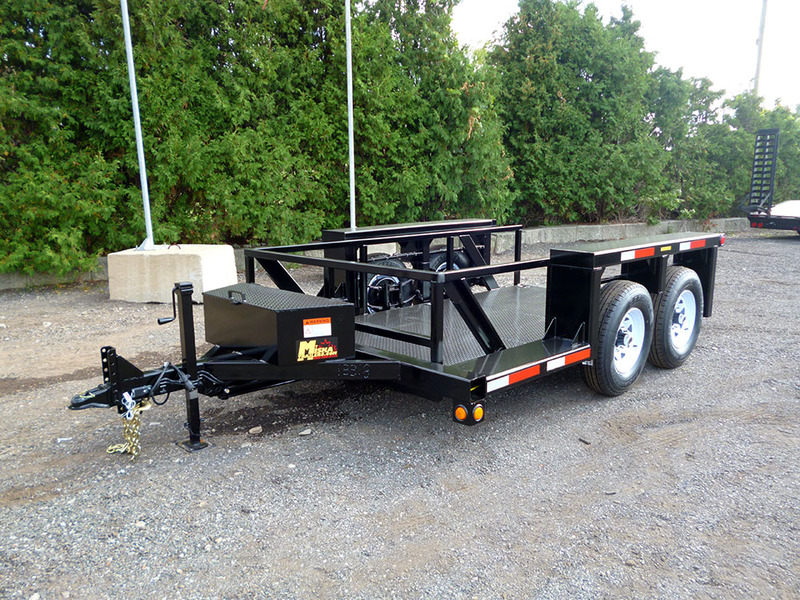 It is a safer and easier way to assist in leveling and stabilizing your trailer. 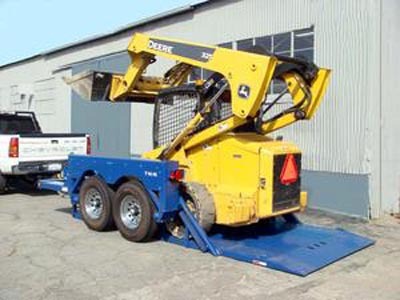 Surge Brake Actuator systems work by the "surge" or "push" of the trailer toward the tow vehicle during deceleration which automatically synchronizes the trailer brakes with the tow vehicle brakes. 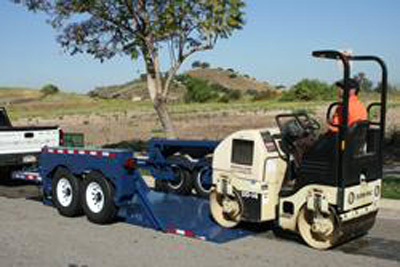 As the trailer pushes against the vehicle, the actuator telescopes together and applies force to its master cylinder, supplying hydraulic pressure to the trailer brakes. Change from standard Electric Brakes to Hydraulic Brakes. Ask about the advantages and disadvantages. A second axle brake gives you increased stopping power for those unforeseen emergences of everyday towing. It will also wear the front and rear tires evenly compared to having a single axle brake. 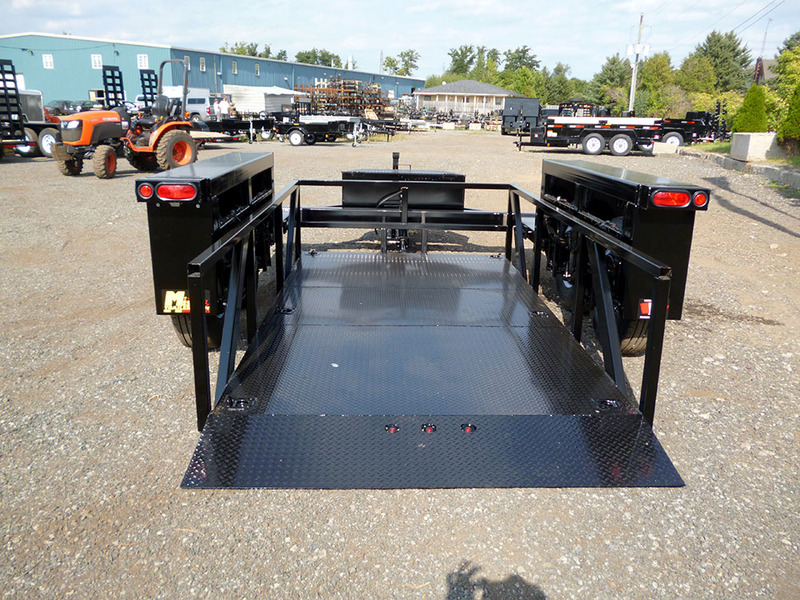 This fully automatic, On-board Battery Tender is designed to fully charge and maintain batteries. The Battery Tender offers charging anywhere that power is available. By keeping the charger on the trailer, damage resulting from pulling traditional chargers off of the storage shelf is eliminated. It has a ten year warranty. Never have to worry about charging a dead battery again. This 6 Watt Battery Trickle Charger is the perfect compliment to our Dump Trailers. It is mounted on top of the toolbox to maximize the efficiency of the sun. This Solar Battery Charger is Weatherproof and Shatterproof. It is also Maintenance Free with built in Overcharge / Discharge Protection Controller - Install it and Forget it! Raise and lower your Miska Dump Trailer from 100 feet away or even while staying inside your vehicle! This remote is a life saver for those less mobile customers, and for the ones that simply love the convenience! Simply hold down a button on the key fob and let the remote control operate your existing 12-volt dc hydraulic pump. Now there is no need to be restricted to one area to operate your application. This convenient wireless system lets you move around and monitor the area while operating your Dump Trailer. This is a safe one person operation and contains an on/off switch on the top of the receiver box. Our heavy duty wheeled dolly is designed for a 60-gallon barrel. This item will transport a back pack blower and has a built-in locking mechanism. Locks are not included. This rack bolts to the basket kit or to the trailer rail and can hold either a 3lb. or 5lb. spool. This rack will securely hold 3 trimmers and has a built-in locking mechanism. Locks are not included. The 3 or 5-gallon beverage cooler rack is designed for either an open or an enclosed trailer. The heavy duty adjustable ball dolly will allow the movement of even large trailers by hand easily. Miska Trailers now come with new super tough acrylic polyurethane finish. Trailers are fully sandblasted, degreased, acid etched, then painted. Let our sales team work for you! Sign up for our E-Newsletter and receive exclusive offers and discounts in your inbox! Miska Trailers is #1 in customer service. 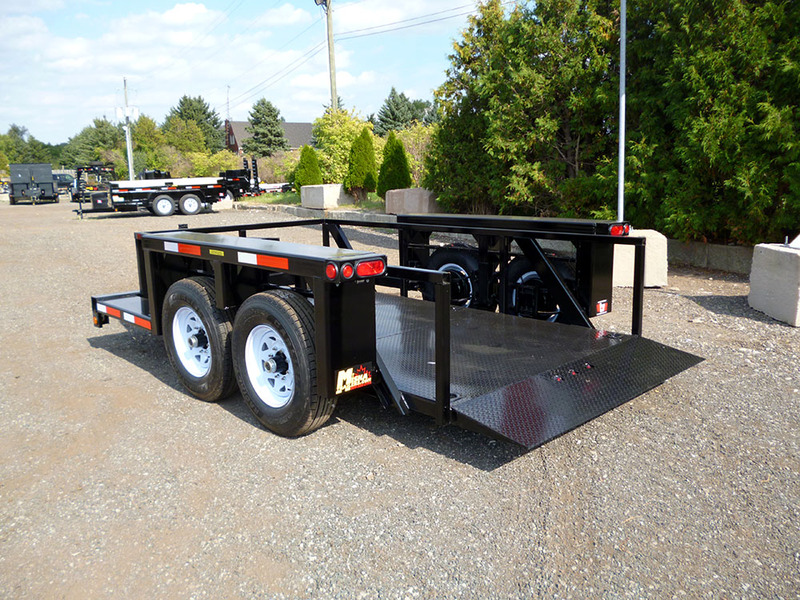 Call or email us if you have any questions about our trailers, services, or anything else you’ve seen on our website. Proud member of the NATM and more!